So now we have nine chickens. Three of them are roosters. That means they eat every day, but don’t contribute anything back to the household. Marsha has a favorite, a little undersized boy she calls “Chicken Little” because he’s constantly carrying on about how the sky is falling and whatever other peril fills the moment. Our chickens are all technically “free range”. When I get up in the morning I let them out of their coop. And they wander around the property eating bugs and making poop. In the evenings I put them back in the coop and lock it up. It’s a young flock. They will begin laying in about August. I’m looking forward to that. Have you ever had fresh yard eggs? You can’t buy them in the grocery store. When I see Chicken Little I think “Rock Cornish Hen”. Okay, the grocery store gets away with selling young undersized chicks and calling them “Cornish”. It’s no real sin if I do too. A little time in the oven, served with roasted potatoes and asparagus. Such a vision! Of my two big Jersey Giant roosters… one will get to stay with the flock. The other will be a real meal, for adults, with left-overs. Have you ever had a roasted free range chicken? You can’t buy them in a grocery store. Courtesy of Nancy Gyes and Alphabet Drills (available at www.cleanrun.com) I’ve come up with the following exercises based on the letter “d”. I have a student here for the weekend for a series of private lessons. She’s interested in the Front Cross as an ailing element of her repertoire. It’s easy to find Front Crosses in the letter “d”. I’ve decided that following along with Nancy’s scripted exercises is making me crazy. So, once again, I’m playing a game of What do you make of this?… and find my own sequences and handling remedies. This is a simple exercise intended to solve the “riddle of sides”. I have one stipulation in handling… the handler must predispose himself to the side of every turn. This means that all of the changes of sides will be forward of the dog (Front Crosses). Without belaboring this sequence with analysis… what I see here as handling would be: a Blind Cross from #1 to #2; a Front Cross from #2 to #3; another Blind Cross from #4 to #5; and another Front Cross from #5 to #6. 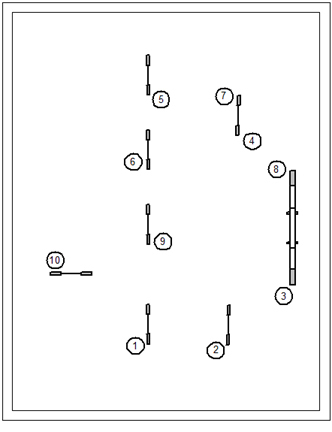 The most technical of these movements is probably the Front Cross in the transition from #5 to #6. This calls for a squaring Front Cross. If the handler commits to a Cross on the landing side of jump #6 prematurely… the dog’s approach to jump #7 will surely be spoiled. 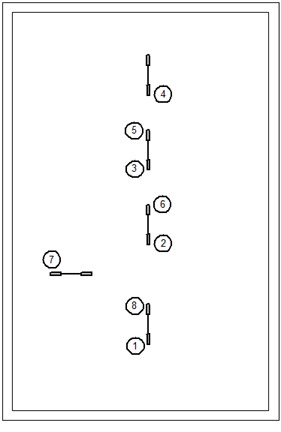 The handler must understand where to set the corner of approach that creates a straight line through jumps #6 and #7… and allow the dog to get to that corner before committing to the Cross. 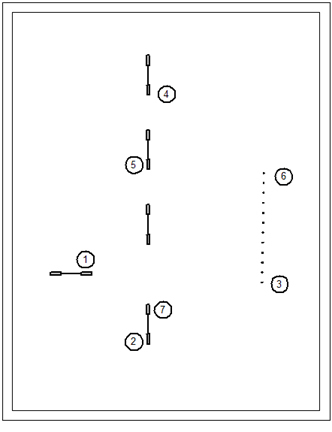 In this exercise the handler will put his Front Cross on the landing side of jump #6. Although this is a simple Front Cross it’s a marvelous opportunity to practice the mechanics of this common movement. I use a “pulling hand” in my Front Crosses so that my movement is always going in the direction of the course (what a concept, that). If you want a more thoughtful discussion of the pulling hand by an intrepid international competitor, you should Google “Jenny Damm”. On the dismount of the dogwalk the handler will have another opportunity to Cross. This calls for what I call a technical Front Cross because it happens on the dismount of a technical obstacle. Note that the mechanics of this movement will be somewhat different for a dog engaged in a 2o2o bottom performance as compared to a dog with running contacts. Because the dog’s path is an acute angle there’s a real possibility here of causing the dog to take a wrong course back up and over the dogwalk if the handler’s movement puts too much pressure back into the dog on his dismount. This sequence requires a single change of sides, but it could be quite technical. You’ll note that the turn from jump #4 to #5 sets a line that goes nowhere near to the entry to the weave poles. So this will call for the handler to be the “architect of the dog’s path.” This is a job for a serpentine Front Cross. This is actually a combination movement, beginning with a Front Cross and resolving into a Post Turn. On the landing side of jump #5 the handler will commit to the cross, and then draw the dog around his “post” position to sweeten the approach to the weave poles. I had a couple interesting moments with my DVD movie collection last week. I was watching Cinderella Man … it occurred to me that the fighter Jimmy Braddock had to fight to earn the championship title must have had a son who starred in a popular sitcom in the 1960’s. Can you name the actor and the character he played? In the movie Terminal, starring Tom Hanks, Viktor Navorski visited an immigration officer every day as a go between for a secret admirer. One of the common interests of the officer and her admirer is that they were both “Trekkies”. She even made the familiar Vulcan hand sign at one point in the movie. So … what was her later connection to Star Trek in the movies? This entry was posted on June 9, 2012 at 7:51 pm and is filed under Course and Sequence Design, Dog Agility Training, Gyes' Alphabet Drills, Handler Training, Raising Chickens. You can follow any responses to this entry through the RSS 2.0 feed. Both comments and pings are currently closed. Zoe Saldana was Uhura in the 2009 Star Trek Movie – which was an excellent movie! True! She was also Natiri in Avatar.